On Sunday afternoon we continued our stroll through Le Marais on the look-out for lunch. The weather was still gorgeous and street artists were scattered across Le Marais filling the air with happy tunes. I saw some places which I had seen on Liza Chloe's Paris guide, like this tea place. But in the end we settled for nothing but the best so we queued up at the most popular falafel joint in Paris on Rue des Rosiers. There was the longest queue even for take-away, but we decided to get a little table inside. Inside we were welcomed with open arms, haha! I ordered le fallafel spécial which is a great big mash up of falafel, fried aubergine, cabbage, cucumber, hummus, tomato, onion and harissa semi-neatly wrapped up in warm pita bread. My mouth starts to water at the mere thought of this deliciously messy thing. Montana went for the much more civilised plate which contained almost everything that I had in my pita bread. As you might understand we couldn't wait to dig in! I topped my pita with lots of extra harissa (or whatever that red spicy, garlic-y, salty sauce was) and it was so delicious. It's even better than the Lebanese food I've tried on Edgware Road in London and I could eat this every week. The best thing is that it's vegetarian and you don't even notice. It's totally understandable why people call this the best falafel in Paris; definitely worth the hype! 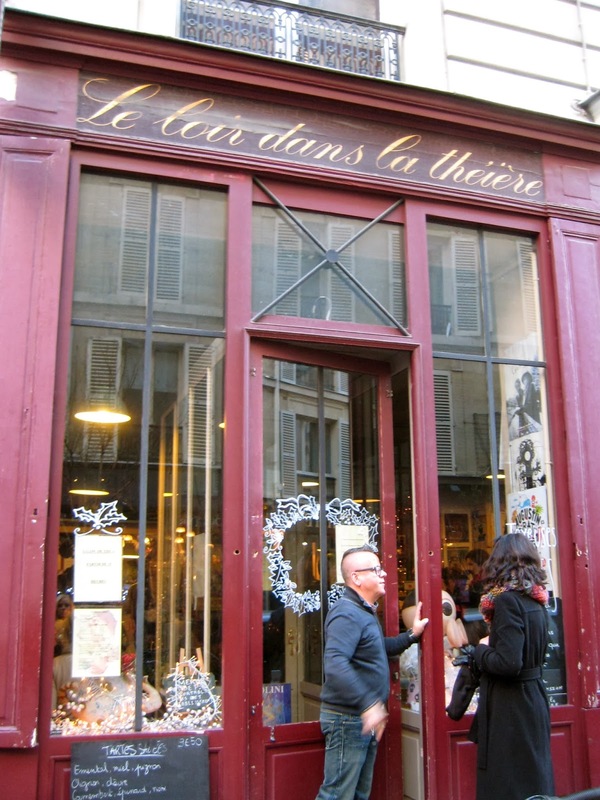 Rue des Rosiers is at the heart of Paris' most vibrant Jewish neighbourhood and it's bursting with kosher bakeries, restaurants and bookshops. We spent the rest of the afternoon walking around and visiting a few vintage stores. When it started to get dark and cold we headed home to recharge our batteries a bit before heading out again for a long evening walk, starting at L'Opéra. Moving on to Galeries Lafayatte, for yet another little stop 'n sniff at Diptique. I hadn't been to this department store before and I was really impressed with the over the top interior. 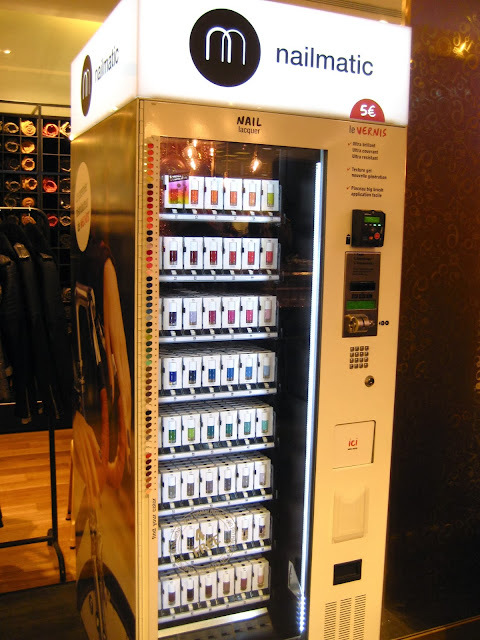 Nail polish vending machine... brilliant! Right before closing I wanted to have a little look inside Printemps, another department store. A bit less impressive than Lafayette, and quite similar to Selfridges in London. The windows at Lafayette and Printemps were super Christmassy and up to Harrods-standards. 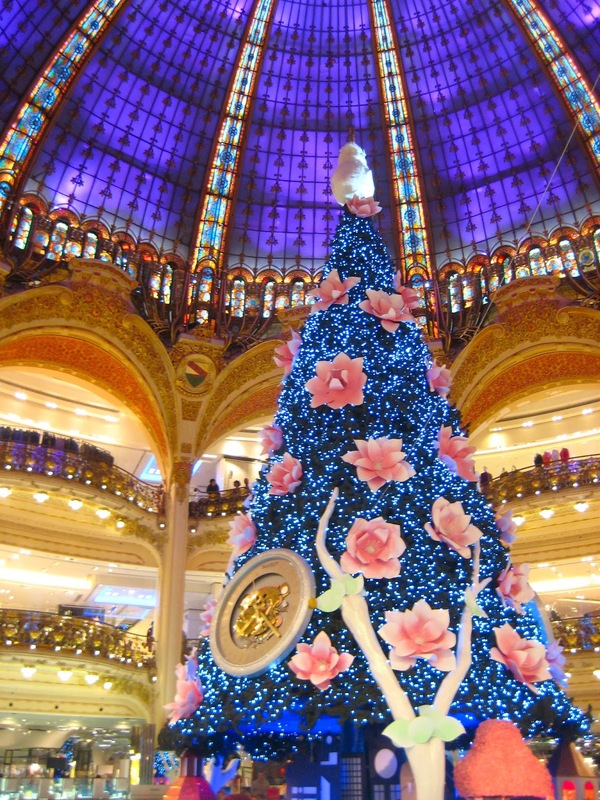 After the shops had closed we walked over to La Madeleine and watched it change from red to blue etc. I love this building. Next we walked over to the massive Christmas market on Les Champs Elysées. After having seen every single stall of the market we walked over to La Place Vendôme, which is one of my favourite places in Paris. There weren't many people there at all, so it felt more special than usual. This little white carousel made it even better. After that Montana insisted on making a detour to Hotel Costes to look at the windows. She clearly knows me very well, since the windows were bursting with flowers. After seeing all that Parisian beauty, we walked home filled with happy feelings ready for a good long sleep.